These are my reflections on the making of "Headwaters." From start to finish. This is my perspective as their producer, friend, and one (of many) of their biggest fans. I believe in why they are making the music they are making, and their hearts behind making this record. This process is an amazing example how a dream unfolds - every big dream is realized one baby step at a time. John Busby, Kerri Owens and Collin Smith , now juniors at UGA, are a part of incredible group of young people that I have had the privilege of getting to know over years. 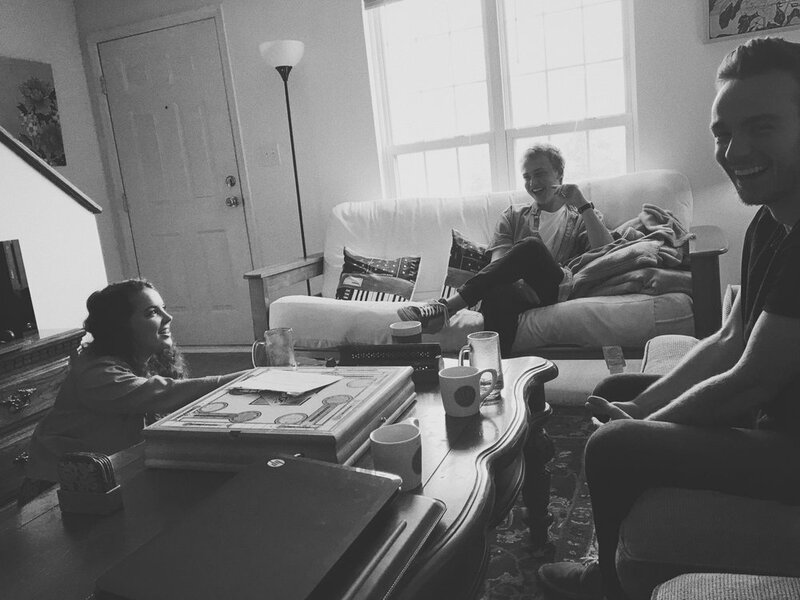 I met each of them briefly their freshman year, and it has been an incredible encouragement and inspiration to watch how they have grown and how God has begun to knit them together as a family and as a creative unit. Last March, Collin began asking me some technical questions about recording music in a living room setting. Their vision was to gather their friends and record some songs they had been writing live. Through a series of events, they were eventually able to come see a session being run at 1093 for our other friends "The Welcome Home." Then we had this thought... "what if we did it here?" Another step taken. From that point on, they hit the ground running with songwriting and rehearsals. Nothing much happens on my end in the April, just a couple pre production meetings at 1000 Faces Coffee (got to get the good stuff). I continue to brainstorm how to set up the session. On April 29th we record. Full day, set up in the AM, Headwaters rehearsal in the afternoon. Then, we hit record. I am going to skip most of the technical reflections on our process because quite frankly, in this case, it didn't matter that much. The songs were incredible and they had the right heart. It couldn't go wrong. But, basically I tried my best to isolate the sources, chose microphones that would not bleed into each other, and positioned certain figure 8 pattern microphones to take advantage of the null areas in their polar pattern. We were also able to further isolate sources by strategically positioning the Gobo's, which are like movable sound blocking walls. Pretty cool and useful tools. I want to thank Josh Parks and Addison Hicks for their help on the production side of this record. Your help made everything go so smoothly. Quick side story, I almost drove my truck off a wall because the driveway ended at a angle i could not see when backing out of the driveway. Addison was my hero in that scenario, and all these amazing guys. Fast forwarding: We spend May, June, and July mixing and mastering slowly. Every is traveling and working throughout the summer so we take are time with it. We finish up the masters in August and get together at my apartment to do a final listening. John Busby makes us all amazing coffee on the V60 and we enjoy the finished product together. There is something so special about taking the time and fully appreciate a journey you have been on with people. Especially with making records because it takes so long to do, it's almost like you have climbed this mountain with your friends and you can finally sit, release your breath, and enjoy the view you all worked to get to. Looking Back: The entire process, to me, was a miracle. Every connection, how smoothly the recording went, the fact that no one hit any wrong notes the whole time, how everything sounded in the end, the amazing relationships and friendships that came of this... It's all such a miracle to me. What I said in the beginning of the post grows and truer and truer with each project that I work on. A dream is not revealed in a day. It's revealed through every "yes" that is said and every small step of faith that is taken towards finishing. John, Kerri and Collin went "yes" all the way from the very beginning. and now look what has come of it! They have created such a beautiful collection of songs for all of us to enjoy. I have been so encouraged by their humility, courage, and purity. They were aware of the temptation to rely on their own strength and were able to overcome and push through on their knees. From the very beginning they surrendered this to God. I truly believe God honored all of us. He honored our desire to make something amazing to be a light in the community. He honored our reliance. He honored the trust. The project was in his hands the whole time. Looking forward: I can't wait to see what comes out of Headwaters in the future. But also, if they never did anything again, it would change nothing about what they just accomplished. Worldly success, to me, can be worse than failure for a human heart. It is not inherently bad, I just think we are inherently prone to forget who makes anything possible. Success confuses us, puffs us up and distracts us from the main point. We need to define success as again, the simple "yes." Headwaters has already won not because they gained a record deal, signed a publishing deal, gained followers or fame. They have won because they felt a pull in their hearts, and they stewarded their time, efforts, talents and energy to pursue it in faith. They stepped out their immediate sight and pursued a vision that required faith to achieve. I believe that this heart and this energy behind their music will release others to pursue their dreams in the same way. This whole album and process has been fire under my seat to run my race even better. Guys, I can't say enough good about this. Thanks for trusting me with your dream. I want to thank John, Kerri and Collin. I want to thank Mark Crafton for capturing the day beautifully. Thanks to Josh Parks and Addison Hicks. Thanks to Philip McClure for giving it art that captured it so well. You guys are amazing. So, without further adieu, here is a link to the record on Spotify. Stream it, save it, share it. and please, enjoy it deeply. Things will only get better.